In 1999, CrownRing opened the doors of its atelier design studio and since then, their jewelry has been a staple for brides and grooms who want something different in their bridal sets—a handcrafted piece of art that attests to the vision of its designer. Thanks to the breathtaking textures that CrownRing works into its wedding jewelry, such as hammered repoussé work in the gold, burnished jewels, and brushed metal, the designer stands apart from any other brand. And here at Northeastern Fine Jewelers, we’re proud to offer their wedding bands to the men and women of our community. The Rope collection has selections for both men and women, and the unique CrownRing sense of style expresses itself as a tightly interwoven braid of precious metal that sits alongside a band of differently-textured gold. While most of these bands have the same 18k gold in the two layers, many pair a different tone with the ropes to create a fascinating contrast, such as rose gold braids set in a brushed white gold band. The end effect is something truly precious, and when CrownRing adds bezel- and invisible-set diamonds to the mix, they create a collection that shouldn’t be overlooked. 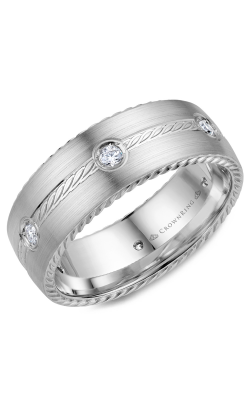 The Classic and Carved collection, as the name implies, houses CrownRing’s most outré choices in textures. It’s clear that CrownRing’s masters of the craft are also masters of lathes and drills, given the stepped gold present in some of this collection’s bands or the etched surface that reminds the viewer of fresh wood bark. Modernity in jewelry expresses itself as an embrace of collected pieces making a greater whole and taking those “pieces” from nature is a reflection of the way CrownRing sees the world. For the man who finds himself hiking through the wilderness more often than he’s in the city, the Classic and Carved collection may provide the perfect wedding band. Why Shop for CrownRing at Northeastern Fine Jewelry? Northeastern Fine Jewelers has been carefully curating its showcases for over 38 years, and because of that experience, we consider ourselves experts about which designers have that “it” factor of elegance and craftsmanship that will wow our customers. CrownRing is one of those designers. In addition, we offer wedding bands and engagement rings from a number of other top-shelf brands, as well as fashion jewelry and Swiss-quality timepieces. If you’re looking for GIA-certified loose diamonds, custom jewelry design, or services to keep your jewelry sparkling for decades to come, Northeastern Fine Jewelers is ready to be your trusted jeweler. If you’re interested in our jewelry or services, contact us at 1-855-795-NEFJ (6335), or visit our showrooms in Schenectady, Albany, or Glens Falls today!